1 WHY IS MY COMPUTER SO SLOW? 1.1 Have you tried rebooting your machine? Let’s be real, “why is my computer so slow?” is one of the most frustrating sentences you’ll say at work, coming in shortly after “Who ate my lunch?”. And unfortunately, it’s one that most of us can relate to. Juggling tasks, meetings and expectations throughout the day is more than enough work, without having to wait for your v e r y s l o w computer to boot up. If you’re reading this, you’ve probably looked up how to fix your PC which feels like it’s running at Medieval speeds, so here are some solutions for you try now to bring your laptop back to 21st century speeds. This is the first thing any “IT person” will ask you, and it’s not without reason. Try restarting your machine as your first port of call. It will do wonders for your machine and your happiness. Rebooting your machine resets it and frees up memory by clearing the RAM. RAM is where data and machine code that are currently being used are stored in a computer. When you boot up a machine, the RAM is empty. Over time it accrues more and more memory, most of which you may not even be using, hence slowing down your machine. More and more RAM will be used by your machine until there is no RAM left. When you RAM is starting to reach full capacity, your machine will become slower and slower. When you reboot your machine, you will be clearing the RAM, making space for you to start using your machine again. In the same way that a machine reboot clears up your RAM, you can speed your PC up by freeing up disk space. Unnecessary or unused software may be taking up RAM without you even realising. Quite often, you may find you have some programs open on your machine that just aren’t being used. Worked on a huge Excel budget spreadsheet this morning? Now working on a PowerPoint in the afternoon? Close the spreadsheet if you’re no longer using it. Having programs like a complex spreadsheet and 80-slide PowerPoint open simultaneously can use up a lot of computer memory. This drastically slows down your machine, especially if you’re using forms of media like images or videos. You might also have bloatware on your machine that isn’t even being used. This is software on PCs or mobile phones that you’re not likely to use and has often be pre-installed by manufacturers. The sheer amount of disk space and memory bloatware can hinder them from being useful tools. By removing said bloatware, you are freeing up RAM to use the functions that you actually want and need. Check out the links below to see how to remove bloatware from Windows and Mac OS machines. If you’re anything like me, you’ll likely have upwards of 3 windows and 90 tabs open at any given point. In fact, you might even be at such advanced levels of tab-hopping that you can’t even see the names of the tabs anymore. Is there such thing as death by too many tabs? If the above is you, your machine may be struggling unnecessarily. Close. The. Tabs. Yes, there might be a lot to close but your CPU will thank you for doing it. To close tabs quickly, simply use CTRL + W for Windows machines or CMD + W for Mac OS. If you’ve closed one too many by accident, no sweat. Is your tab problem becoming too much for your PC? Do you want to understand why you open so many tabs and learn how to stop it? Here is a really helpful article by Trello that shows you how to be smarter with your browser tabs. It may be that your PC has been infected with a virus without your knowing which can cause your machine to run slowly. We really recommend that you install an antivirus software on your machine which will alert you if you have been infected. The point of antivirus is to actively detect and remove PC viruses, so it makes sense to have one on your computer if you’re using the internet in any capacity (click to see best antivirus of 2018). To read more on other ways to identify a virus, check out this article from Norton. Okay, okay. We lied. We’re giving you a bonus day as we’re feeling generous. You’re welcome. And the tip is…… prevent your machine from overheating. Simples. If you are using a desktop or laptop computer, keep it on a solid surface like your desk, without anything above or under it. Make sure it’s moderately clean – so check your fans. 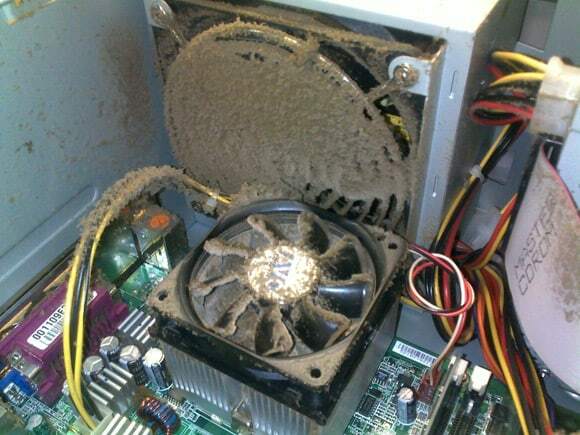 This applies more to desktop machines than laptops, but if the fan is clogged with dirt and dust clean it out. It may sound obvious, but don’t go spraying detergent on your machine! Turn the machine off before you attempt to clean the fan. If you don’t know how to do this – contact an expert! Here’s a link to see other ways of keeping your machine cool! Overheating machines will be slow as CPUs will reduce their clock speed when they feel themselves overheating. So there we have it, 5 (fine, 6) ways you can make your PC feel and act faster. Of course, if you find your machine is still slow despite taking these precautions and is diminishing your productivity, you should contact an expert to assist you further.